Forget apple pie. Let go of the pumpkin tradition. 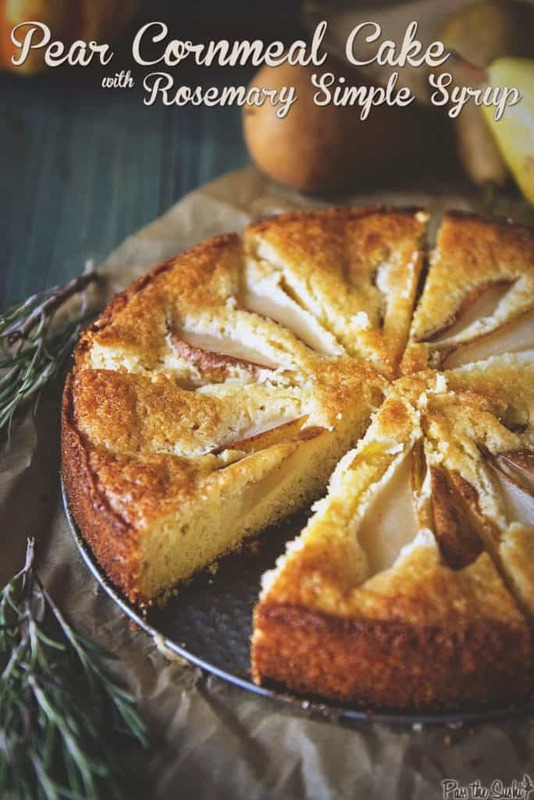 Set out this simple pear cornmeal cake this holiday season and watch their shock. This cake will take a fraction of the time you would spend rolling out dough and a quarter of the stress. It’s so uncomplicated that you can go back to actually enjoying your time in the kitchen, with company, and doing the things that matter. The rosemary simple syrup is understated, and the perfect touch to really pull the flavors together. Let them judge for themselves. This cake is the show stopper this holiday season. Preheat the oven to 350 degrees F. Grease a 9" springform pan and set aside. Whisk the flour, corneal, baking powder, baking soda, salt and 1 cup sugar in a large bowl. In another bowl, whisk the buttermilk, eggs, and melted butter. Stir the wet ingredients into the flour mixture until everything is just moistened. Spoon into the prepared pan. Press the pears gently into the surface of the batter. Bake for 45 to 55 minutes, until the top is golden and a toothpick inserted in the center comes out clean. Allow to cool on a wire rack to 15 minutes before removing the pan and cooling completely. While the cake cools, make the rosemary simple syrup (make this ahead of time if needed - you'll want to spoon it on while the cake is still warm). In a small saucepan combine the 1/4 cup water with the remaining 1/4 cup sugar. Add the rosemary sprigs and cook over medium heat. Stir until the sugar is dissolved. Remove from heat and allow to sit for at least 30 minutes. Remove the rosemary sprigs and brush over the still warm cake. That looks really nice, a sort of rustic beauty, and I love the combination of savoury herbs and desserts. What grind of polenta did you use? I made a cornmeal cake once and out came out a bit gritty, where yours looks wonderfully fluffy! 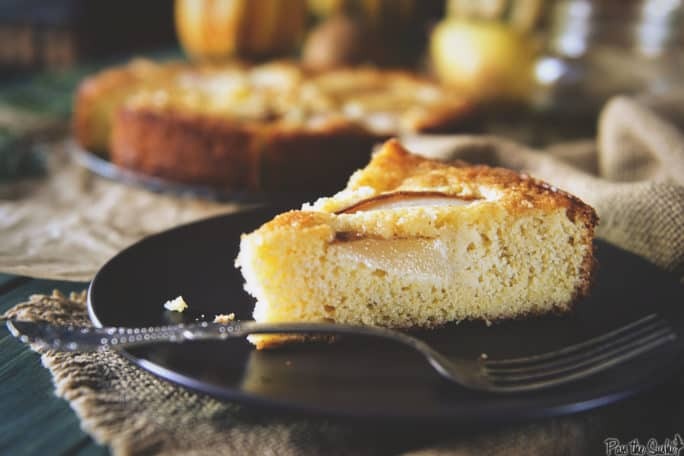 I am definitely guilty of forgetting about pear in the fall with all the apple and pumpkin floating around. I am making a pear-cranberry sauce though! Pie making totally takes a lot of time and stress…and who has time for that?! 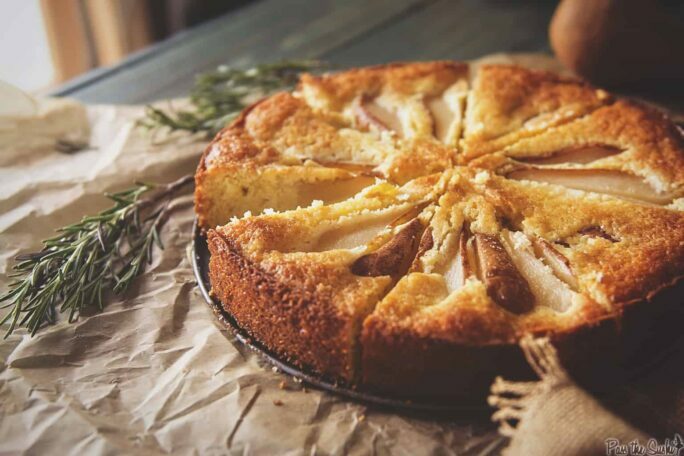 Love that this cake is no stress, full of fall, and uber delicious!